After a buildup of Western airpower in the Mediterranean this week, the French foreign minister was asked if the military operation was meant to remove Muammar el-Qaddafi from power: “No. The plan is to help Libyans choose their future.” It is in this strikingly resonant world backdrop that Theatre Mir has staged their fourth production, Bertolt Brecht’s 1944 musical play, The Caucasian Chalk Circle. The production is the opening to the “Full Circle Festival” in collaboration with The State Theatre. Theatre Mir does not do easy plays. Chalk Circle is intellectual, philosophical and incredibly relevant in terms of current events in places such as Egypt, Libya and Tunisia. It is the type of play a UN Ambassador might want to take in during his free time. All the while, director Jonathan Berry and Theatre Mir have created a production that is equally entertaining and human. Alistair Beaton’s recent contemporary translation also deserves much of the credit. One notable attribute of this translation is Beaton’s inclusion of the “play-within-a-play” prologue, wherein a diplomatic official (crafted with great care and humor by Stephen Loch) must convince a war-torn town and their farmers that a collectivist economic and social outlook is necessary for survival. However, the official must first watch a play. To this he pleads, after being informed that it will last two and a half hours, “Couldn’t you make it any shorter?” Simply put, it probably could be, but in the end you do not regret the time you’ve spent. 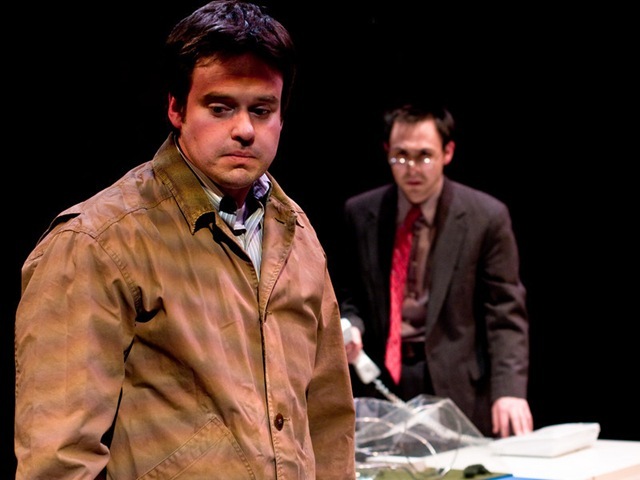 The play revolves around the idea that when you take down a totalitarian government, and the people are left to decide their future, there is often a circular occurrence where the oppressed become the oppressor. It also challenges what it means to be “good” in such conflicts. We are taken through the tale by the singing narrator, played by the talented guitarist and actor, Zeke Sulkes. Sulkes played a similar function in The Hypocrites’ Pirates of Penzance (our review ★★★½) earlier this year, which has some conceptual parallels to this production with the cast picking up and playing various instruments throughout the play. This element also achieves Brecht’s famed “alienation” effect by always reminding the audience that these are actors in a play. Chance Bone’s folk rock scoring adds a driving cultural liveliness to the evening. After the prologue, we begin the play in a Caucasian town called Grusinia amidst an emerging civil war. The governor (played by Yosh Hayashi, and ironically mocked by Hayashi later when he takes on his more pivotal role). The governor is beheaded and his widow (Mira Vasiljevic) flees into exile leaving behind her infant child, Michael. A servant girl, Grusha (Kristen Secrist), discovers the child and takes him away from the town to safety. 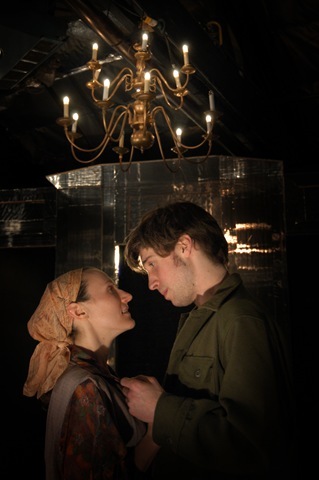 She first has pledged her love and allegiance to a departing soldier, Simon (Jeremy Kahn). Throughout her travels she battles, begs and borrows to protect the child and quickly develops a maternal attachment. She eventually weds a dying man (a crass Sean Bolger) to provide for the child, which makes things complicated upon Simon’s return. Secrist plays Grusha with utmost passion, ambition and love. She leaves nothing on the table with this role and carries the first half of the play. We learn with Simon’s return that war has ended. Order has seemingly returned, and so has the governor’s wife looking for her child. 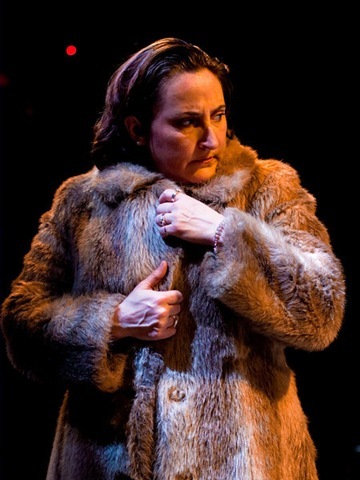 However, the second half of this play is dominated by one of Brecht’s most fascinating characters, Azdak. He is the drunken scholar turned judge who redefines the definition of what it means to be “good.” Yosh Hayashi is thrilling as Azdak. He is constantly versatile and unpredictable. His performance truly showcases his talents, proving to be one of the most captivating actors working in this city. 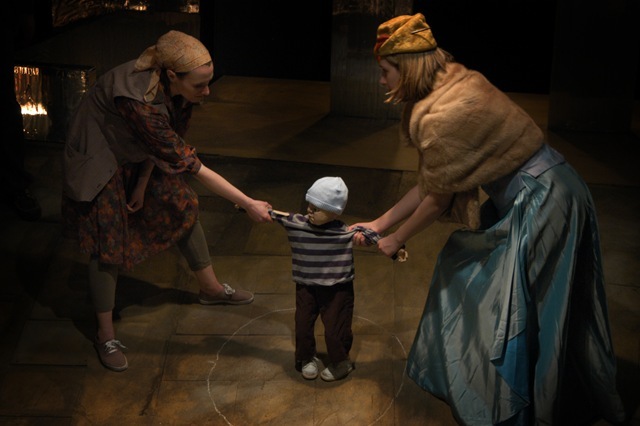 The play boils down to the chalk circle in which the young Michael (now a toddler created effectively in puppet form by designer Megan Hovany) must stand in the middle of the circle while Grusha and the biological mother compete in a tug of war with the child. The outcome is perfect and creates wonderful philosophical debate during after-show drinks. This particular space at The Viaduct poses many challenges for any set designer or director. However, scenic designer Chelsea Warren creates a found material stylistic set. 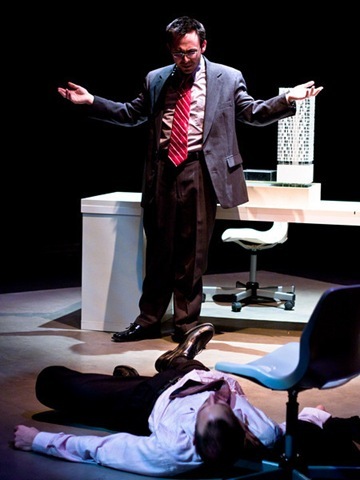 It is functional and avoids realism, playing well with Brecht’s intent. Melanie Berner’s costumes are an excellent guide to help the audience keep track of which social class the ensemble is playing at any given time. Meanwhile, Bone’s underscoring is as effective as his melodies. A certain use of a slide whistle here, or a saxophone bellow there, add humor and energy to lines. Overall, Berry makes excellent use of his cast through employing them in various roles as musicians, dancers, actors and stagehands. His staging provides for fascinating movement, including one moment when Grusha must cross a treacherous bridge with the child to flee her pursuers. The ingenious and simple technical method of achieving this moment culminates in one of the most immediate and suspenseful moments of the evening. 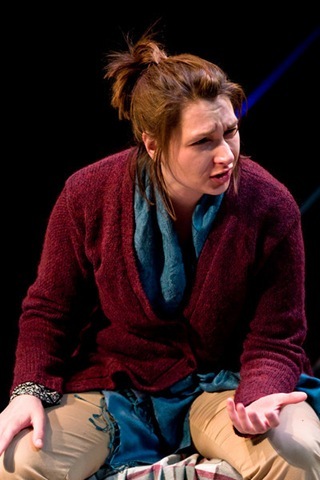 The Caucasian Chalk Circle continues at The Viaduct through April 3rd, with performances Thursdays, Fridays, and Saturdays at 7pm and Sundays at 3pm. Running time is 2 hours and 30 minutes with one 10 min. intermission. Tickets are $25 (regular price), $20 (seniors), $15 (students) and $10 (industry). 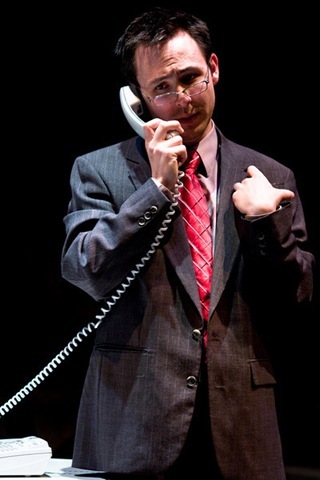 For more info and reservations call (773) 296-6024 or visit: www.theatremir.com. 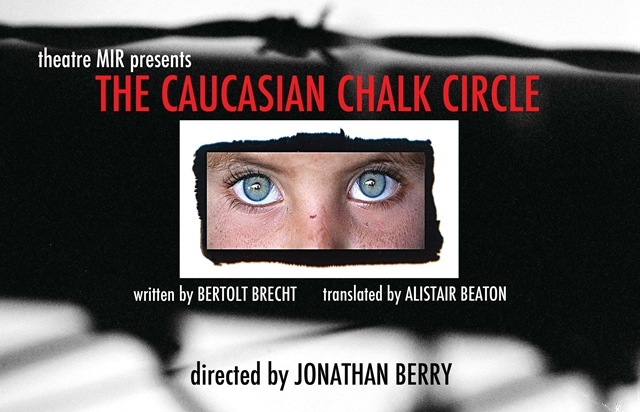 The Caucasian Chalk Circle is part of the “Full Circle Festival” in collaboration with The State to provide audiences with two uniquely different versions of The Caucasian Chalk Circle. The State Theatre will close the festival with The Voodoo Chalk Circle, a retelling of Brecht’s story adapted by Chelsea Marcantel, April 8-May 1. This adaptation will be set amidst a hurricane strike in New Orleans. Festival tickets to both performances are $30.